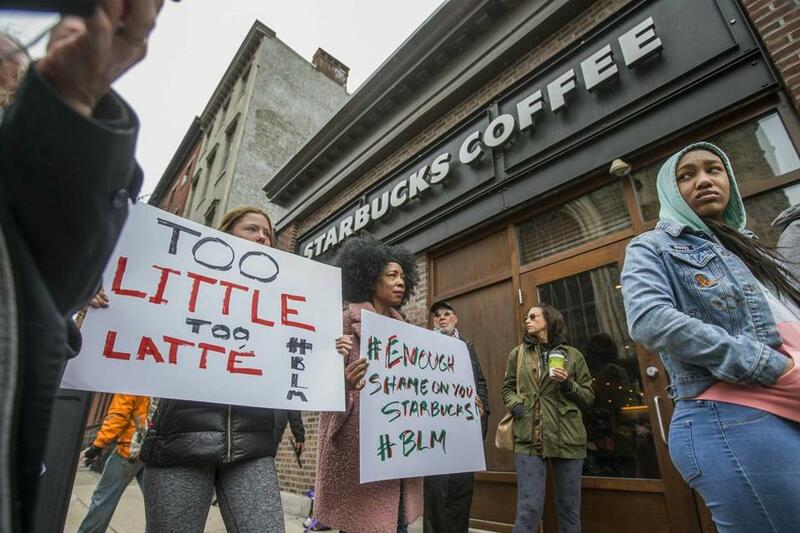 Protesters outside of a Starbucks in Philadelphia on Sunday, where two black men were arrested after employees called police to say the men were trespassing. DRIVING WHILE BLACK. Walking while black. Shopping while black. Selling CDs while black. Listening to music in a car while black. Asking for directions while black. Sitting in Starbucks while black. To be black is to always be in the wrong place at the wrong time because, in America, there is never a right place for black people. Several recent events again drove home that point like a stake through the heart. Two black men in Philadelphia were arrested at a Starbucks for being two black men in Starbucks. They hadn’t ordered anything and were waiting for a friend. This was enough to make a Starbucks employee call the police. The announcement comes after two black men were arrested in a Philadelphia Starbucks store, sparking protests and calls for a boycott. Not long after several officers arrived, the men were perp-walked off the premises in handcuffs. Hours later, they were released without charges. Three years ago, the coffeehouse chain launched its quickly aborted “Race Together” campaign to spark conversations about race. Now it’s in the piping-hot center of another debate about racial profiling. A video of the incident has been viewed more than 9 million times, and the story is now a national headline. For black people, this video has been viral forever. This is what we live with every damn day. Everything black people do is weighted by irrational white fear. It’s mentally exhausting to always be on guard, even during mundane moments like waiting in a coffee shop – or asking for directions. Last week, Brennan Walker, a 14-year-old African-American, had to walk to his Rochester Hills, Mich., school after missing the bus. When he got lost on his four-mile trek, Walker went to a house and knocked on the door, hoping to get directions. The woman who answered accused him of trying to break in — then it got worse. A white man, wielding a shotgun, ran at the teen. His shot missed Walker, who took off as soon as he saw the gun. Jeffrey Craig Zeigler, 53, has been charged with assault with intent to murder and possession of a firearm in the commission of a felony. Walker said he chose that house because he saw a neighborhood-watch sticker and thought it would be safe. Years ago when I was dating a white woman, I used to half-joke that being with her meant that if we got lost in a predominately white area, she could be the one to ask for directions. Before GPS, I would often opt for squinting at maps and driving miles out of my way rather than ask for help. Even with my lousy sense of direction, I wouldn’t run the risk of ending up in jail or dead because someone criminalized my blackness. After Trayvon Martin was shot to death in 2012, the media became obsessed with “the talk” many black parents have with their sons about how to behave around white people, especially cops. I never got a version of that conversation. Still, I always knew not to reach into my bag in a store unless I’m in full view of the cashier or to leave the house without ID. When you’re black, you just know. Just as the two men in Starbucks knew not to do anything that would further escalate an already ridiculous predicament. On “Good Morning America,” Starbucks CEO Kevin Johnson called what happened to those two black men “reprehensible” and plans to meet with them to apologize personally. GMA host Robin Roberts called this a “a teachable moment,” but I don’t believe that. This nation has had several centuries’ worth of teachable moments, and little is ever learned. Yes, there has been progress, but that’s slight solace when you can still be arrested simply for sitting in a coffee shop. Nothing will ever change until a majority of white people in this nation stop perceiving black existence as sinister and suspicious. Talking about racism may hurt white people’s feelings, but their unchecked racism continues to endanger our black lives. Renée Graham can be reached at renee.graham@globe.com. Follow her on Twitter @reneeygraham.